Expression of mutant desmin leads to increased mechanical stiffness, resulting in excessive stress and increased mechanical vulnerability of human muscle cells. Filamin A is essential for active cell stiffening but not passive stiffening under external force. The rate of assembly and disassembly of clustered integrin receptors known as focal adhesions determines the speed of cell migration on 2-dimensional surfaces. The focal adhesion protein NEDD9 is a key signalling intermediary in mesenchymal cell migration, however whether NEDD9 plays a role in regulating focal adhesion dynamics has not previously been reported. For this study we were kindly given mouse embryo fibroblasts (MEFs) from mice in which the NEDD9 gene has been depleted (NEDD9 -/- MEFs). As shown by Geraldine O'Neill's group NEDD9 -/- MEFs have reduced speed and persistence and are more rounded in 3D collagen gels, we questioned whether NEDD9 may regulate the cell adhesion force to the extra-cellular matrix. Therefore, we analysed adhesion force to fibronectin by incubating cells with fibronectin-coated magnetic beads and exposing them to increasing, lateral pulling force in the range of 0 to 40 nN with the high force magnetic tweezer device. 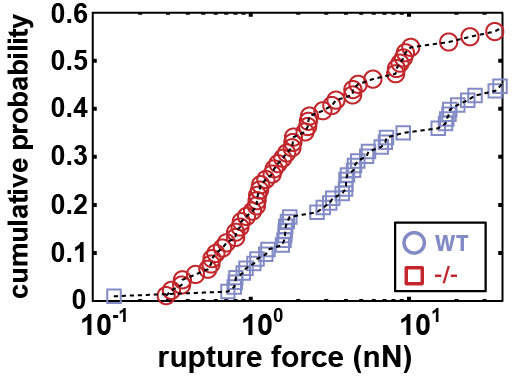 The force at which a bead detached (F_rup), if at all, was recorded. 10,000 cells were plated in 35 mm dishes for 24 hours, and fibronectin-coated magnetic beads were then added to the cells and incubated for 30 min at 37°C and 5% CO2. Prior to measurements, the dishes were gently washed with fresh medium to remove unbound beads and then placed on a heated microscope stage. A force that was linearly increasing from 0 to 40 nN over 10 seconds was then applied to the beads. The speed of the force ramp was 4 nN/s. Bright-field images of the cell, the bead, and the needle tip were taken by a CCD camera (ORCA ER Hamamatsu) at a rate of 40 frames per second at 40x magnification. Bead positions were tracked in real time using an intensity-weighted centre-of-mass algorithm. The force value at which a bead detached from the cell surface was recorded. About 200 rupture experiments were perfomed. 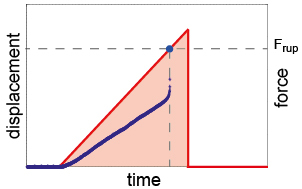 The left plot shows the cumulative rupture probatility versus rupture force. The median adhesion strength in NEDD9 deficient MEF cells was highly (7 fold) reduced (red circles) compared with WT MEF cells (grey squares) revealing a significant reduction in adhesion strengh due to missing Need9. Figure 1| Fraction of detached fibronectin-coated beads versus pulling force. Adhesion strength was lower in NEDD9-/- MEFs (red circles, n = 91) compared with WT MEFs (grey squares, n = 103). Our results suggest that NEDD9 may stabilize focal adhesions and increase adhesion force to the extra-cellular matrix, providing new insight into the function of NEDD9 in 3D cell migration. © Copyright 2013 Navid Bonakdar. All Rights Reserved.